Golden Rod, Solidago virgaurea, produces tall plumes of striking golden flowers. An infusion of the leaves used as a remedy for urinary tract infections. Use of the flowers approved by German Commission E as a remedy for bladder stones, kidney stones and urinary tract infection. Golden Rod is native of Europe, Asia and North Africa. Prefers light, well drained soils in an open sunny position. The flowers are golden yellow, appearing from midsummer to autumn. Drought and frost resistant. A deciduous, perennial plant growing to 1m x 0.5m. 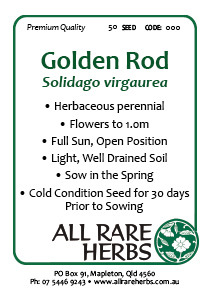 Be the first to review “Golden Rod, seed” Click here to cancel reply.